Consumers spend over 80 percent of their disposable income within 25 miles from home, while less than 5 percent is spent online. We believe the most relevant programs are those that add value on the purchases people make every day in their communities – dining, shopping, recreation, auto maintenance & repair, household services – in addition to the savings we offer at popular online sites and in our travel categories. And not just the residents of major metropolitan markets. We believe that everyone from big cities to rural towns deserves to enjoy savings in their own neighborhood. 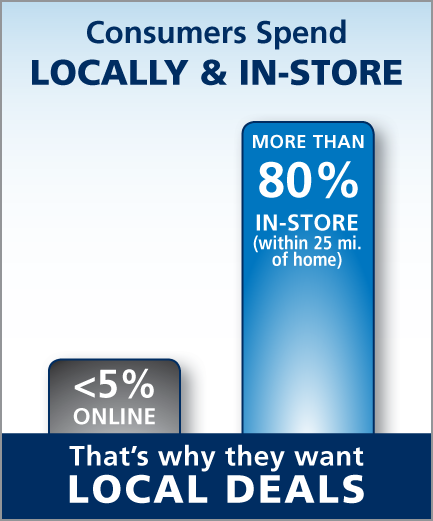 As a result, Access brick-and-mortar merchant offers are available in 100% of all metropolitan and micropolitan markets, and in-store deals within driving distance of over 99.6% of U.S. consumers. The Access merchant network is well known among organizations for being the largest of its kind in America. Yet we’re just as proud of our reputation among merchants for being the most sensitive to their business needs as well. Our unique approach to merchant relations involves teaming up with our merchants, not just extracting big discounts at their expense. We work closely with our merchant partners to help them create compelling offers that will increase traffic and help them grow their business. In addition, we offer educational materials, marketing support and telephone assistance to ensure their experience with the program is as beneficial as it is for consumers. This focus on the merchant means longer-term relationships, deeper discounts, more exclusive offers, a superior selection in everyday consumer categories, and better customer acceptance at the point of sale.